I have spoken of Crossroads multiple times since I completed my walk, but never with much clarity. I can very easily write of the wonderful people I was with, or individual circumstances, but when it comes to piecing the entire picture together, I wander around and never really reach a conclusion. And still, there is a certain confusion surrounding those three months. Time does so much for the heart. Sometimes, time heals, and other times, it causes deeper hurt. It completely depends on the situation. Josh writes on his blog of his thoughts after giving himself some time without really thinking of the summer. I highly recommend that you read his post, because while I am obviously not the same person as he, and therefore didn’t go through all that he did, he says some things that I think are relevant to all of us who walked last summer, at least on Northern walk. I really respect those who can just “not think about” a life-changing event for a while. I think it’s wonderful and possibly one of the best way to process. Iwish I could do that. But at least at this point, I can’t work that way. Right now, I’m struggling to not think about it every day, every hour. I can’t keep living in the past. It doesn’t do any good, and won’t help me learn. That being said, I have been able to spend some time over the last three months simply thinking and journaling. Why did I decide to walk Crossroads? I’ve been called crazy for doing it, and in a way, I agree with that adjective. You can’t be completely sane if you decide to walk across the country for an entire summer. To fly to the other side of the country, meet up with people from California, Missouri, Wisconsin, Maryland, Virginia, South Carolina, and Ireland; and essentially, upon meeting, entrust them with your life. We quite literally kept each other alive this summer. I was completely comfortable with my decision to walk Crossroads all of last semester. It wasn’t until the morning I left that I started freaking out. I had a breakdown, which doesn’t happen except rarely, and I thought, there’s no freaking way I can do this. I had processed my summer in advance (as much as I could), gone through all the logical succession of what I would encounter, and accepted that it would be difficult. But the morning of May 16, I questioned my sanity. So why did I do this? When I began, I honestly didn’t know. I’ll be 100% completely honest. I still don’t know. Well, that’s only partially true. I know that I walked for the unborn. I know that I needed to stand for life at all stages in a concrete way. But I didn’t need to walk across America in order to do that. I believe that Crossroads was put in my path (no pun intended) because I needed it. I just got finished saying that I don’t fully know why I did it. That’s because it takes me a heck of a long time to process anything. (You can ask anyone I walked with how true this is. I was the most indecisive person on the walk, by a long shot. In fact, we thought about having a week when Mr. Philosopher (Peter) couldn’t philosophize and Ms. Disney (Kirstin) couldn’t talk about Disney and Ms. Indecisive (yours truly) had to make all the decisions. It didn’t happen...) We all took the Myers-Briggs test during week 2, and I came out as 100% introverted each and every time (I took it 6 times because I didn’t trust my own answers). Wait. So I did a walk, with strangers, where I had to talk to people at Walmart about my mission every time I went to buy peanut butter, and I’m an introvert? whyyyy???? Because I needed a challenge. And I didn’t know that I needed it until it was over. Oh, now naive I was at the beginning! I expected the physical challenge, but not once did I think about how emotionally and spiritually draining this summer would be. I shared some of these challenges already, but I want to do so in a little more detail now. The physical strain began right at the beginning, week one. In the course of 5 days, we walked through the city of Seattle, along the highway, over the mountains, and began entering the desert. We reached the highway on the first day. It had been drizzling all day long, but as rush hour hit, the rain got harder. We had no rain gear with us, and after about a mile, we gave up avoiding the 3-inch-deep puddles, stopped flinching when we were hit with water as the semis drove by, and embraced the squoosh of our sneakers. Paired with the fact that we (Josh and I) drank over a gallon of water that shift, necessitating frequent stops at restrooms, we were quite uncomfortable. Later in the week, we conquered the mountains. Although it was late May, the snow had not yet melted, and we could see our breath as we walked through some snow. Pressured by the fact that this stretch of road would be dangerous in the dark, we pushed to finish over 30 miles each day. It was a few weeks later that I asked myself, “Why the heckam I doing this?” for the first time. I guess it had something to do with the fact that we had re-walked a section of windy road, through a ravine, that day shift had already finished for us. It was partially our fault, partially their fault, and neither group was thinking that day. It had been a difficult night, and when we discovered our mistake, we were all ready to just give up. When we tried to sleep in the van after we walked, an animal outside kept us awake the whole time. We all got about 45 minutes of sleep that night. Yet we had to remember what, who, we were walking for. It’s the sacrifice that we’re there for, and we had to embrace that suffering. Each one of us had our moments of physical weakness. One member of the group had to go home not once but twice because of health challenges. Another member had a serious cold for a couple weeks. Someone else’s foot got infected, shin splints weren’t uncommon, and blisters were abundant. I had a sort of allergic reaction to some sausage and spent a night pacing in a Walmart parking lot, and later got heat exhaustion twice. During this time, I learned perseverance. I learned the value of suffering, especially in silence. There is a difference between saying, “Gosh, my legs are killing me!” and giving a mile-by-mile update at how badly you ache, how thirsty you are, how you can’t wait to just go to bed. Hearing a constant update would be tremendously discouraging, and while you’re suffering anyway, the last thing needed is discouragement. Then there were the times when emotional and spiritual suffering really kicked in. I think each of us had days when we were really struggling. I look at our journey in two ways- our physical progress across the country, and our spiritual journey as individuals and as a group. I believe we all began by fighting the battle of Crossroads- the challenges that we were fighting because we were a part of this tremendous journey. And then came a week when we all conquered, so to speak, this “Crossroads challenge” and entered deeply into our own personal difficulties that we brought with us from home. We all got there at the same time. And so began Hell Week. There was not a single person who wasn’t “off” the week of July 2-6. On the Saturday that ended "hell week", I wrote in my journal: “Well, we all made it through the Week of Hell…………………this has been such a crazy week, a crazy summer. I know I'm going to look back and just laugh. It's a huge lesson in trust, and it's a lesson I haven't really learned yet. It's a lesson in humility- having to admit you're weak or you're wrong. In honesty. Faith. Joy, Friendship. So many good lessons. I hope to all hope that this week goes better than last ..."
That week, those who usually kept the group encouraged were discouraged themselves, those who lifted spirits with laughter weren’t laughing. There were a couple (read: very, very few) encouraging texts flying around, but not close to as many as usual. We didn’t talk a lot during dinner. Long car/RV rides were stressful, not fun and exciting. That week, I had this text conversation with one of my teammates. They wrote, “Okay, so something definitely seems wrong. Just wanna say I’m here if you want to talk. If not, I won’t bug you about it…” to which I responded, “Thanks. This has been a rough week for me and I got to the end of my “put on a happy face” rope this afternoon…” Who was I to talk? As if enough hadn’t already happened, I had just lost this teammate’s saint medals in the wash, and they were disappointed, yet they didn’t get upset at me. Had I been in their position, at least that week, I would have lost it. Lose it I did, later that night in the car. Just silently. Yes, I frequently “put on a happy face” this summer. Is it a bad thing to fake happiness? I honestly believe that it depends on the situation. There were two or three of us this summer who frequently took the role of being the happy ones. We tried to keep the morale of the group up. But it can get really hard to always be that person, especially when those who you’re trying to cheer up are still not happy. I say this not to point fingers, because honestly, its just my personality to try to cheer people up even when I’m having a bad day. It’s not a chore for me. But sometimes the cheerer-uppers need to be cheered up too. And that week was when I realized how much Mass meant to me. If I didn’t have Jesus that week, or any day, for that matter, I know I would have fallen apart more often than I did. (Surprise, teammates! I wasn’t as together as I appeared! *sigh* Oh, the beauty/confusion of being somewhat of a stoic…) Mass united me with the universal Church, and I knew I could depend on the graces of Communion to give me a spiritual boost. Mass also united me in a deeper way with my team, as we all offered our entire selves on the altar and asked for the graces to make it through one more day. An even greater challenge for me was to open up to my team. Being an introvert, it takes me a little while to feel comfortable sharing any part of myself with others. Yes, I fully realize that we’re not supposed to share our hearts with people the first week we know them. But when you’re living with people for 13 weeks, it’s kinda strange if you don’t share anything. After I had recognized and accepted that these people were actually trustworthy, I was able to, little by little, share bits of myself with them. I found that some of the best conversations occurred during night shift. I don’t know what it was about walking at night, but there was just something about the stars being above you and the road expanding as far as you could see in the dark. For me, I had three conversations that really stand out to me as being truly blessed. The first was, in fact, during night shift; we were doing a 10-mile walk, the air was cool, and it was a conversation in which, at the end, we both really understood where the other was coming from. The second was difficult and deep, and again happened at night, but this time was at the Little Sisters of the Poor’s home for the elderly where we were staying the weekend. This one was so hard for me to begin, because it was born of my “I’m driving the struggle bus” experience over the previous 3 weeks. But ultimately, I’m so glad I had the conversation and I will be eternally grateful for the other person’s willingness to let me share my heart and to be open in return. And finally, the last was sitting on the gravel in an RV park during the last week of the walk. I was able to really share with someone who I hadn’t been able to previously, and vice versa and that pouring out of hearts has continued past the walk. I have learned what a blessing vulnerability is. Frankly, vulnerability is something I’m quite horrible at, but this summer taught me that it can be ok to open up to people. Not everyone is going to betray my trust. Now, I have some very concrete examples for myself of occasions when vulnerability paid off, both for myself and others. The hardest thing that happened this summer was the passing away of Andrew, one of the walkers on central walk, after he was struck by a car while he was walking. Although none of Northern Walk had ever met him, there’s a certain camaraderie you have with a person who is going through the exact same thing as you. That week, we learned so much as every one of us debated whether or not we were going to continue the walk. It’s not easy to think about not finishing something that you’ve dedicated your summer to. For some, it was an easy decision; others debated for a couple days. Ultimately, our entire group remained on the walk. Walking was even more meaningful following the accident: we were walking not only for the unborn and for our own growth, but also for Andrew. We were finishing what he was unable to finish. Crossroads was truly a unique experience. Most people can’t say that they’ve walked through 14 states in one summer, touring the corn fields and stumbling across hidden towns featuring "World Famous Milkshakes". Or that they’ve slept in an RV with 11 other people for a weekend. (or gone 5 days without a shower? sshhhh…. Hey. Just bein' real.) Or that they’ve brushed their teeth in a pasture. Washed altar linens in an outdoor spigot. Or that they made lifelong friends in a matter of weeks. I have quite a few really good friends. Some I’ve known for 12 years. Others I met in high school. Some I met in college. But the only people who I can claim I really got to know within weeks of meeting them are my Crossroads teammates. I can say with certainty that if I ever need something, I can call any one of my walking buddies and they’d respond in an instant. And I can state with equal certainty that if any of them ever need anything, even if it’s just to talk, I’d drop everything to help them. I hate tossing around the words “I love you”. I have a quote hanging in my room that says "And Love is a word used too much and much too soon"; I think those are special words for special people. But I can tell you with my whole heart that I love these people. They are and forever will be my family. It's interesting, when I got home in August, I was able to see my 2 closest friends (that I've known since Kindergarten) for a couple hours. At the end of our time together, they both said to me, "You've changed, and I don't really know how. But it's for the better". That's exactly how I feel. I can't put my finger on how I changed, or what precisely brought about that change, but I do believe that it was for the better. Maybe now you have a better understanding of why I can’t easily explain my time on Crossroads. Yes, I can give a pretty darn good talk at a parish. I can convince people to donate money and ask them to pray for us. But explaining my own personal experience? As with anything life-changing, it’ll takes a little while. Still, it’s a story I’m more than willing to share. Like I mentioned at the beginning, it’s easy for me to think about Crossroads, but I have come to the understanding that in order to truly grow from this summer, I need to digest it all and let it penetrate my life. I’ve obviously changed, so I need to let that change fully happen and fully effect me. I hope that through these few, weak, insufficient words that I’ve put together, you’re able to gain a deeper insight into the walk and into my heart. If you have a spare week during a summer, or maybe even a whole summer free, I’d encourage you all to think and pray about doing Crossroads. I can assure you that you will grow like you never grew before. You’ll laugh harder than ever. You’ll overcome personal fears, and you'll conquer mountains, figuratively and literally. Lastly, I’m going to ask you to pray for Crossroads and everyone involved. Pray for our directors. Pray for all of us giving talks for Crossroads over our Christmas breaks*. Pray for the first-ever Australian walk that starts in 6 days. Pray for all walkers, past, present, and future. It’s a difficult mission, yet also oh-so-rewarding, and I can say from personal experience that there’s definitely a spiritual fight going on in Heaven over this amazing organization. Please feel free to contact me with any questions or comments about what I’ve said. You can either leave a comment if you’d like me to address it on my blog, or email me at 14exodus14@gmail.com if you’d prefer I email you directly. *I’ll be speaking to about 5 classes at my high school before Christmas… yikes. I feel old. I remember Crossroads people coming to speak when I was a sophomore in high school. And now, 4 years later, “those people” is me. Today was one of those days that I realized how much I missed my Crossroads team. I guess it started yesterday. In a matter of 24 hours, I received a letter from one, had lunch with a second, skyped a third, had a text conversation with a fourth, and facebook-messaged a fifth. I miss seeing Stephanie's beautiful acts of service. The way Grace made us all smile. Yes, I can honestly say that I think of these people (and all the others who walked with us) like family. I learnedso much from each and every one of them. I learned faith, respect, and genuine love. I learned how to set boundaries, how to respect others' boundaries, and how to open up my preconceived notions of "the perfect boundary". They helped me change some of my views, while other views were made stronger. (**) I learned how to share a space the size of a postage stamp with 12 people at the same time. This group helped me through some extremely difficult moments, and they were all there rejoicing with me at other times. They let me into their lives, and I have gladly let them into mine as well. Not all groups of people would gel as well as we did. Not all past Crossroads teams had the amazing experience that we did. I'm guessing that if many other groups were faced with our "hell week", they might have packed up and gone home right then. But because we supported each other, suffered with each other, and lifted each other up in prayer, we made it through that week, and we all grew and became stronger because of it. You guys have become my second family. I thank God every day that He brought you into my life. I'm sorry that I don't get to talk to some of you as often as I'd like, but that doesn't mean that I've forgotten about you. This summer was by far the best summer I've ever had, and I hope many more Northern Crossroads teams after us have the wonderful times and crazy adventures that we did. I love you, Grace, Kirstin, Stephanie, Amanda, Claire, John, Peter, Zechariah, Father Dave, Mario, Josh, Dan, and Alex. Thank you all for being... you. *and yes, even though they weren't with us the entire time, I miss Zechariah, Amanda, Daniel, Alexander, Father Dave, and Claire as well... I didn't forget you!! **I first wrote "solidified", but that gave me an awkward feeling.... WHY JOSH WHY?!? It's so hard to believe that it's already been two weeks since school started, and three weeks since I arrived back on campus. I honestly really love it here, and when I call Steubenville my "second home", I mean it 100%. I've gotta say, my perspectives on so many things have changed since this summer. Not just perspectives, but habits and daily activities. I drink a lot more water, I eat trail mix like it's going out of style, I have no qualms about doing dishes in the dorm bathroom sink, and if my cell phone goes out of service for an hour, I may not even notice. I wake up a heck of a lot faster, and when I go to bed, I crash (2:30 am fire alarm? didn't phase me). I value conversations with friends and correspondence with family more. I find myself "dropping in" to the chapel at random times, and I lovelovelovelove adoration (I missed that this summer!) I pray the divine office every morning and evening. My views of dating, dorm "visitation hours", and kneeling to receive communion have all changed, whether slightly or drastically. And oh, walking the hills across campus? No biggie. Still, it's hard to tell what all the ways I've changed are. Is it possible to see all the fruits from an entire summer in just 4 short weeks after completing the journey? I can wholeheartedly say that this summer changed me, yet I can't say exactly how. I can just feel, sense, a change, for the better. Even two of my friends said to me, "You're different!" "How?" I asked. "We don't exactly know. But you're different, and it's a really good kind of different." As I move on from this summer, I'll look back often and see all the good that happened. I'll even revisit those difficult days, because I know they helped form me. Hopefully, I'll be able to see someday how Crossroads made me who I am today. But for now, I'm just gonna trust that God will reveal it all, in His perfect timing. I have mixed feelings about sharing summer happenings- I'm worried I'll forget something. Happy you get to find out what went on in Rhonda (the RV). Overjoyed that I get to think about it. Sad because it's over. And so, over the next few/many days/weeks, I'll sporadically share bits and pieces of the summer with you. We worry that these nutso people will get on our nerves. We laugh some more and play Apples to Apples. We go to Seattle and John holds a fish. We think the first 5 miles is sooo long... and drink 1 1/2 gallons of water in one day. And then we drink some more water. 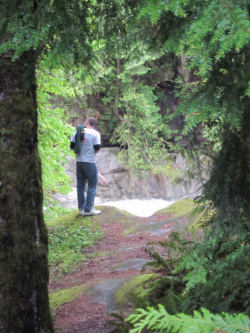 We explore little paths off the road, and stop briefly to watch the water rushing past us. We look at the mountains that are oh-so-close and say to ourselves "Did we really just climb UP over a mile?!? And that was only the first 3 days. Last weekend, we went into New York city to do a little sightseeing. And I learned what could be one of the biggest lessons of the whole trip. Episcopalians are Christians too. They've got something in common with us as Catholics. We're all Christian. Yeah, yeah, I knew this already. I did. But it didn't really hit me until last Saturday. Because Peter and I walked into St. Thomas Episcopal church, which is right across the street, practically, from St. Patrick's Cathedral. As I entered, I was struck by the beauty of the architecture. I would have to say that it was up there on my list of favorite churches. My eye was immediately drawn to a side altar, to the left of the main altar. There was a service going on (it was noontime) and I walked quietly to the front to admire the carvings behind the altar. And then I sat down in a pew and watched the service. I looked, and I watched, and my jaw dropped. I saw a man dressed in vestments, facing the altar and elevating a host, then a chalice. I saw him genuflect in reverence. I watched as the people responded, and he said a prayer. And then they came forward to the altar rail, where they knelt while he distributed the hosts and chalice. What was this?! Most Roman Catholics don't have the kind of reverence that these people had. I had always believed (assumed, really), at least a little bit, that Protestants went to church on Sundays, where they sang hymns, heard a sermon, and may have a communion service. I never, ever thought that I would see a group at a weekday service. As Peter and I read the liturgy card in the back of the church, I read their beliefs, and the beauty of it all hit me. Over and over and over again. Do you realize the beauty and grace of this? In an age where division seems to be the norm, we have so much in common with other Christians. Shouldn't this be something that we hold on to? That we cherish and remember more often? I truly believe that it is. I was overwhelmed. I don't know if anyone else understood what I had seen. While I get their perspective as well (that St. Patrick's is really cool), I just couldn't get that picture of the service in St. Thomas out of my head. Even on Monday, when we went back to the city, I encouraged everyone to visit. And even though I don't think anyone did, maybe, just maybe the thought was planted. Perhaps they will go, one day, and experience what I did last Saturday. I am beginning my last week on Crossroads. Josh will leave this afternoon, Mario and Claire tomorrow night, and the rest of us will slowly disperse to cities around the country to begin a new school year. I have a feeling that you all will be hearing a lot about Crossroads from me in the next couple weeks: reflections, fun stories, (hopefully) lots of pictures. I hope you don't mind! I also hope that you've been able to experience some of it with me this summer. Unfortunately, I haven't been able to post half as much as I would have liked, but I'm sure I'll make it up this semester! Please keep us in your prayers as we walk into DC and end this crazy amazing journey. You're all certainly in mine. Two months ago, if you had told me that I'd be "that person" sitting in McDonalds with a Frappe and a computer, enthusiastically typing away, I never would have believed you. I have decided that typing blog posts on my phone is totally not worth it, because of the number of typos, so alas, you must wait until I have opportunities such as this one to take advantage of free Wi-Fi. Thankfully, today's night local (aka, Walmart) is a 1 minute walk from McD's. I also never thought I'd be ok with seeing roadkill so close and personal. Like, 1 foot away. I never thought I would wash dishes with water from a spigot 2 feet off the ground. That I'd drain pasta in a parking lot. That I would drive an RV before I drove a 8-seater van. Be ok with popping blisters. Eat the same lunch 5 days in a row. Beg for money at Masses. Accept cookies from people I've never met. Go to Walmart at 2:30 in the morning. Sleep overnight in a Walmart parking lot. Shop at Walmart multiple times a day, 4 days in a row. We are a walking advertisement (haha, no pun intended) for Walmart, iPhone, and Chrysler. Except now we have a Dodge van, so that doesn't really work anymore. Basically, Crossroads has made me go sooo far outside my comfort zone! On this journey, I have done oodles of things that I never would have done before. And honestly, I needed to break out of my box. I’m guessing that most, if not all of you have experienced this, but I tend to make lots of comparisons while I’m walking. Comparisons that I don’t think I would “normally” make if I weren’t walking across the country. So bear with me for a minute. We walk for miles on end, up and down hills. Often times, we don’t see the van while we’re walking, but other times, we see it the entire time. Still other times, it comes and goes in and out of view. We strain forward, battling through the elements, through unkind words and sore feet. Our muscles ache, yet still we walk. And in the end, we reach the van and enjoy a well-deserved rest. Isn’t this so much like our journey towards Heaven? Our life goes on, and we reach towards God. Sometimes, we see glimpses of Him in our lives; we see Him in other people, and we see His hand at work. But it’s rare that we can see Him for a really long time. Sometimes we see an expression of His love shortly, then we lose it. Or we reach towards Him and He seems just out of reach. And yet, we keep trying, because we know that even when we can’t see Him, He is there. There are people who oppose us, who try to get in the way of our faith journey. We’ll go through a time when it’s just so easy to believe in God, like walking downhill, then next thing we know, we’re questioning everything. It’s hard, but we continue forward, we push onward, we journey towards our everlasting reward. Sometimes we don’t know why we continue on. It’s difficult, this journey. As we continue on our pilgrimage, both towards DC, but more importantly, towards Heaven, let’s remember that it’s only through the support of others that we will get there. We all say every weekend that “we’re all volunteers, and we rely on the generosity of others to make it across the country”. Well, we’re all sinners, and we rely on the support and prayers of our brothers and sisters in Christ to make it to Heaven. We’re moving past the halfway point of our walk, and it’s easier to get frustrated with each other now that we know each other better. We’re getting beaten down, both in our battle against the world and in our own personal battles. I think we’ve done a good job of this so far, but let’s make it a point to continue to build each other up. To not be afraid to ask for help and prayers. I love you all as brothers and sisters, and please know that each and every one of you is in my prayers each time I walk. Please keep us in your prayers. That's what helps us do this! This post requires a pre-explanation: Who is Stanley? I will give you some hints. Stanley likes flies. He is green. He lives in a pot. Night Shift loves him. Stanley is a Venus Fly Trap. Don’t ask why we scoured Lowes’, Walmart’s, and Hy-Vee’s galore to find him. All you need to know is that when we (Mario, Stephanie, Josh, and I) found him, we were quite elated. But Stanley wasn’t happy living in an RV. He quickly began drooping and no amount of sustenance, whether it be flies or cereal, would make him happy again. So Stanley resided in our (non-working) sink, looking sad in a half-filled cup of water. And just 10 minutes ago, Stephanie buried him in the trashcan. He came quickly, and died almost as quickly. And this, my friends, is the situation I'm in. My health came back, and went away very quickly. Monday night, I cried for the first time while on Crossroads. I think anyone in my situation would have. Let me back up a minute. I was put on day shift again after 2 weeks on night. Monday, it was super hot. Like, 100. I was prepared, though: I bought a hat, I had sunglasses, sunscreen, and plenty of water. I started by first shift of the week walking with Grace. She and I walked for a mile, then I had to get back in the van because my calves were killing me. I had had 3 charlie horses the night before, so I thought that’s what it was. After another 10 miles of others walking, Grace and I headed out again. I had gone 2 before I started getting heat exhaustion symptoms. At 3.5 I got back into the van, thinking that water and protein would make me feel all better and I could walk again later. Well, faintness turned into spacey-ness turned into an escalating pounding headache, and I could feel my blood sugar crashing. Nothing that I did helped. Meanwhile, Amanda’s blood sugar was crashing too, so she couldn’t walk or drive, therefore John had to drive the whole way. Peter is gone for the week, so Josh is doing most of the walking on night shift because Mario is injured. Kirstin's ankle is hurting. Michael, the guy who's with us for the week, also hurt his ankle. It ended up that Grace did the majority of the walking (like, 21 out of 30 miles). We got our 30 for the day, but just barely. When I got back to the RV, I called Mom and after talking to her I realized that my body just can’t do day shift anymore. I was crying, Mom was crying, Amanda and Grace were crying; we were overall just a huge mess. I came in the RV where John and Josh were and (with tears streaming down my face) I told them “I just can’t do day shift anymore”. Thankfully, they had foreseen this happening (as I had. I had just been in denial…) and had put me on day shift just as a trial. They were understanding (thanks, guys!) and promptly moved me to night. I drank some water, told my family what was going on, and went to bed. *sigh* This isn’t how I was envisioning the rest of my Crossroads journey. I figured I’d be the healthy one who could be put on any shift. Not the girl who has to ask special consideration. I hate having people worry, and I hate not being able to do what everyone else does. I just really have to remember that God does know what he’s doing. He knows that I will do just as much good on night shift as I would have on day shift. That I can pray as much and do just as many sacrifices on night. There is a reason. So I am permanently on night shift. And I’m ok with that. As I said to my family, that just means that I’ll have more time to call people!! Please, please, please keep us in your prayers. Even though our RV is air conditioned, it’s still sweltering in here, and I can’t even imagine what day shift is going through at the moment. Pray for our health, our safety, and God’s will in every aspect of this walk. I think everyone enters the Crossroads experience expecting something. They may not know precisely what it is, but they're definitely expecting it. It could be new friends, a life changing experience, to get in shape, to grow closer to God, to see cool scenery, to explore the country, and so much more. One of my expectations was not to get sick. I was eternally grateful for those 6 hours of sleep. So grateful that I did night shift that night. An extra long night shift which lasted 14 hours and in which we walked 40 miles. A night shift that lasted so long that I walked in the sun again. Which was super stupid and dumb on my part, because I had heat exhaustion. Heat exhaustion. Why, oh why, oh why??? Did you know that the symptoms for heat exhaustion are pretty similar to those of heat stroke? And that heat stroke can be fatal? Yeah, me neither. Needless to say, I was pretty freaked out for a little while. If there's anything I hate, it's being sick. Not because I feel yucky, but because I feel so useless. Like I should be up and doing things, helping people make dinner and clean, but instead I have to sit on the sofa and do nothing. And then I'll feel better and do something, and immediately after another wave of faintness will come over me and I'll have to sit down right away. People, I promise I'm not faking! Last night, I sat in the hot tub for a little bit, making me feel 1000% better, and then my mom was like "That probably wasn't the best idea for someone who has heat exhaustion".... oh yeah. Whoops. Kinda forgot about that. This is all to say... I've been thinking about the reason I'm here. My expectations. I wanted to grow in my faith, to gain friendships, to witness to the dignity of life. But as I've sat with a spinning head, I've wondered if my last couple days have even been worthwhile. If I'm not walking, is there even a point to being here? I've come to realize that there is. Why am I here? For prayer and sacrifice. I'm getting a heck of a lot of prayer in sitting on this sofa. It's a huge sacrifice for me to not walk. I thought I was here to walk. But there's so much more than that. I am here to walk, but I can witness in other ways too. Last night during dinner, Josh said something that I've always heard, but it really hit me. He said "Make every bite a prayer!" I may pray my morning offering when I wake up, but do I mean those words I say? Do I mean that I offer "my prayers, works, joys, and sufferings of the day"? Or do I say it because that's what I've been doing for years? Do I remember that literally everything I do while I'm here is for the greater glory of God, and that everything should be a prayer? It's definitely something that I need to work on. So here, I present you with Peter's latest work. Enjoy your day (and your week!) everyone! Pray for us all as we venture into the flatness that is South Dakota. I've never particularly liked that song, but lately, I've been realizing how absolutely true it is. How often do we spend time looking at the world that God gave us and really, truly appreciate it? I'm so grateful that I've had the chance to do just that while on Crossroads. I am now (temporarily) on night shift. In all honesty, I was really excited to take part in the whole "walking at night" thing. I was one of only two people on the walk that hadn't been on night shift yet. It's such a different experience. my team warns me that night shift isn't really all that great: it's hard, it's tiring, and by mid-week, I'll be cranky and exhausted. nevertheless, I'm excited to begin. we drive two hours to our starting point. Kirstin and Josh are starting out, so Zechariah, Stephanie, and I wait in the car. While waiting, Zechariah and I record some ridiculous dances to (maybe possibly) make a fun music video. Have you ever watched the sun set while standing on a hill overlooking a valley, with mountains in the distance? I got to do that on Sunday night, and it was magnificent. Even the swarms of mosquitoes couldn't keep my happiness level low. josh and I set out. We pray our rosary, and as the moon rises in front of us, we talk. funny stories from growing up and from high school. the moon was so bright that we could see our shadows behind us. we make jokes about alien attacks, and listen to birds that sound like hyenas. the moon is above us, shining and brilliant in the sky. when I get back in the car, I sleep for a couple hours, then it's time to walk again. Zechariah and I begin walking and pray another rosary. It's early in the morning and the sun has started to rise. conversation comes surprisingly easy at 4:30 am. there's a hint of glow in the sky, and as time goes on, the sky lights up into a dozen different colors: reds, oranges, yellows. we watch deer scamper across a field and stop right by the car, about a mile up the road. cows wandered out to pasture and began their gentle mooing. If there was a night that I could remember for the rest of my life, it would absolutely and definitely be monday night. josh and I set out around 9. the moon was bright; not as bright as the night before, but more full. after praying our rosary, we talked about faith. every once in a while, a train would pass on the tracks next to us, its light piercing the darkness up ahead. the gentle chugging was a reassuring sound that I normally wouldn't have been aware of. Semi trucks passed and i could feel the whoosh of air that they pulled behind them. the air was cool but as we walked further, we were able to take our sweatshirts off and just wear the reflective vests over our PRO-LIFE shirts. As we heard a car or truck approach, we'd turn on our flashlights, the soft light showing where we were and lighting our way. sleep comes surprisingly easy when you're walking at night. we're awakened at 4 am to begin the last 5-mile shift of the night. we were both tired, so after the rosary, we fell into silence. with 4.2 miles to go, we could already see the van up ahead, hazard lights flashing bright in the dark. its amazing how your senses are heightened at that hour. the moonlight reflected off a white barn, a mailbox, and three simple crosses at the side of the road. in unison, our footsteps were loud on the pavement. every so often, one or the other of us would kick a stone, and it would bounce to the side. I could hear the wind blow gently through the grass. horses whinnied and beat their hooves in a nearby stable. a small stream trickled into a ditch nearby. just before the sun began to rise, the birds started singing. First, just a single song, then the whole area was filled with melodies and harmonies of all different birds. some loud, some soft; they combined to form a symphony for us as we walked. I could see a wooden pole rising against the lightening sky, a nest perched on top. as a large bird, probably an eagle, rose from the nest, Josh broke the silence. Not the awkward i'm-trying-to-think-of-something-to-say-and-can't silence, but beautiful silence. A Full Silence that can only come from listening to God and all of His creation. the sky started to be illuminated. directly to my right was the full moon, still shining with all its glory, and to my left was a hazy sky. deep gray-ish purple mountains rose against a lighter purple sky, set off by medium blue clouds. words cannot begin to describe the depth of beauty that filled that space. we were surrounded by mountains on all sides, by whispy clouds up above and the gently rising sun as the cherry on top. It was such a different sunrise than the morning before, but just as, if not more, phenomenal. God is a magnificent painter. What can I say; I'm in love. I'm in love with the beauty that I have the ability to see on this journey. I'm in love with the Creator of that beauty; the One who made it all, with my God, the Maker of the Heavens and the Earth.